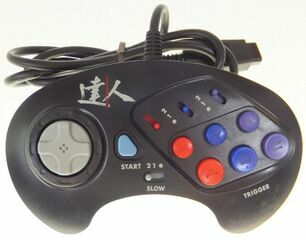 The Control Pad Tatsujin (コントローラーパッド 達人) by Mumin is a third-party six-button controller for the Sega Mega Drive, complete with added turbo features. Strangely its turbo features link and , and and and together. Main article: Control Pad Tatsujin/Magazine articles.